Ektro continues the stream of releases in the New Wave of Finnish Heavy Metal genre on their new sub-label. 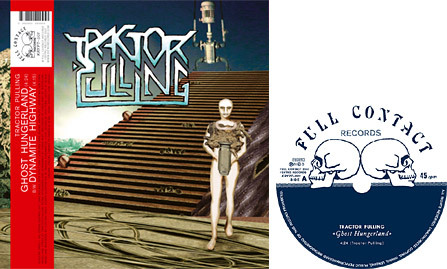 In addition to Circle, Pharaoh Overlord, Steel Mammoth and Krypt Axeripper there is a new 7” out by Tractor Pulling whose music presents the purest form of 80’s styled heavy metal of all the bands mentioned above. The band is reported to be formed by Electric Erko: guitar, vocals, Eeto von Tomb: bass and Brutalpo: drums. Chris Buff does some extra keyboards and screaming. “Ghost Hungerland” is close to four-and-a-half-minute long blast of heavy, true 80’s styled heavy metal with roaring Lemmy vocals. The track includes some lead guitar melodies and works very well indeed! The B-side’s “Dynamite Highway” is mid-tempo, heavy metal rocking but this one has just a pinch of stoner feel in it, as well. The vocals are suitably rugged and manly, and the guitar soloing great circular saw- like fuzz. Tough going! Tractor Pulling is a bit like Steel Mammoth, only heavier. I like this! The single also has a really nice cover art work, so it’s worth getting while it’s still available!